The November issue of THE BEE reported that the 10,000-square-foot community garden on Cesar Chavez Boulevard (formerly S.E. 39th) at S.E. Ellis Street was in trouble. Gardeners had been informed that there were two problems. First, the nonprofit "Grow Portland", which had managed the garden for the past six years, would no longer be able to do so, since the organization had elected henceforth to work solely with schools. Their hope was that Portland Parks and Recreation (PP&R) would take over the management of the fifty garden plots. Second, a generous neighbor who for years had allowed the garden to connect a water hose in the garden to his water service, is no longer able to maintain that arrangement. Consequently, the gardeners were informed that if the land were to continue as a garden, a water meter would need to be installed, at the price of $8,788. Gardeners at the site waited nervously during December to hear if Portland Parks & Recreation would agree to take over management of the land plot. Finally word was communicated to Susan Schrepping, the woman who owns the property, that yes – the Parks Bureau would manage the garden in the future. Then the community gardeners, who live in several Inner Southeast neighborhoods, waited warily in January to hear if the needed $8,788 had been raised to fund the water meter. David Beller, Executive Director of Grow Portland, had agreed to stay involved long enough to oversee the fundraising. At the end of January, Beller announced happily that the $8,788 had finally been raised from small donations and grants. However, everyone involved soon learned that a THIRD obstacle had arisen. In late February, in the process of reviewing the request to install a new water meter for the garden, the Portland Water Bureau decided that a water main extension would be needed, at a cost $24,219. Hopes for continuing the garden were dimmed by this new bombshell. "Upon closer physical inspection they [the Water Bureau] determined an extension is not needed. The water service for the Cesar Chavez Community Garden will be installed at a cost of $8,788, which is equal to the amount raised by Grow Portland." The happy result of resolving all three obstacles is that this land that is extremely fertile due to decades of farming will remain, for now, a PP&R community garden on Cesar Chavez Boulevard. 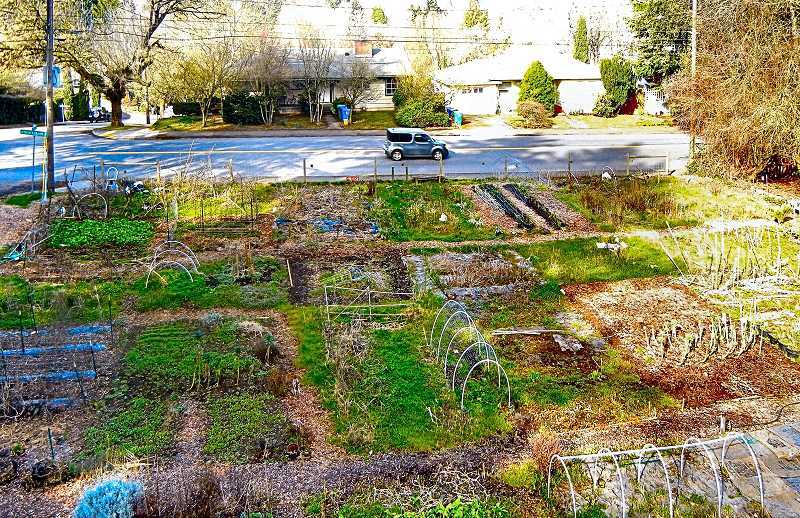 Those interested in getting a plot at the Cesar Chavez Community Garden can pursue the request online – www.portlandoregon.gov/parks/52116 – or by calling Ms. Niemi.